It's that time again. The time of year when we should all get down on our hands and knees and thank our poor mothers for putting up with us and not giving up on us before we reached adulthood and realized that they were right and we were wrong. The time that we ourselves as mothers should be showered with praise and presents for just one day. Hey, having someone do the dishes for us doesn't hurt either. 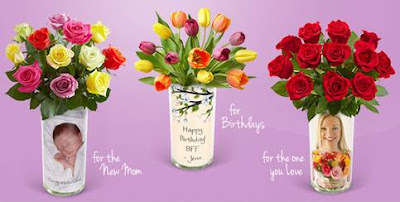 If you are still searching for the perfect Mother's Day gift though, look no further than the new Vase Expressions bouquets from 1-800-Flowers.com. These bouquets mix a beautiful arrangement of flowers with a memory that any mom will cherish! 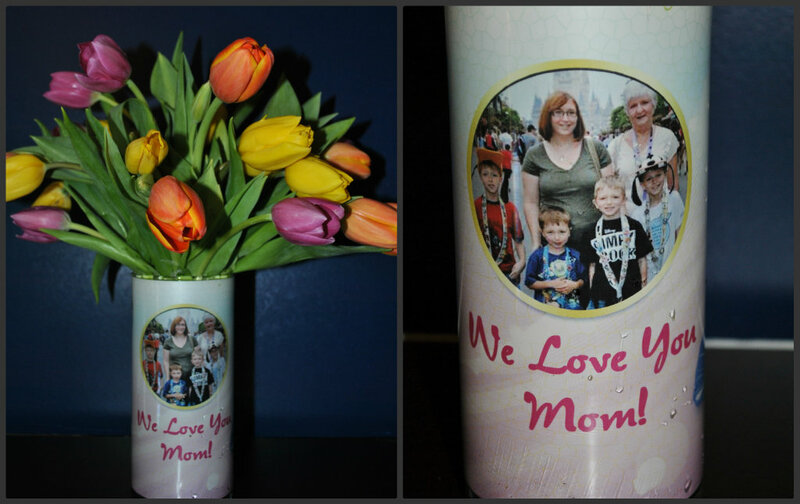 Starting at only $49.99, the new Vase Expressions bouquets are personalized with your own family photo along with a special message such as "I love you mom." Not only are these great for Mother's Day, but they would make the perfect gift regardless of the holiday. The process is simple. You just upload a photo and personalized message, choose your favorite fresh flowers and great the perfect arrangement. The recipient will receive the beautifully boxed display in a waterproof vase with your image on it. Even after the flowers are long gone, the vase will remain as a personalized gift that can be used time and again. I received a beautiful Vase Expressions bouquet complete with a stunning arrangement of tulips. I was really impressed with the way the flowers were boxed and delivered. Nothing was out of place, the flowers were not wilted and they were really well secured. It is always exciting to get flowers if you are a woman and opening that purple box was so much fun. The vase itself is simple, but what really gives it the wow factor is the personalized image and message printed on the waterproof sleeve inside. The picture was great quality and I love that it is on a waterproof sleeve and not actually the vase itself. This way if the vase happens to break, the sleeve will be able to be reused and placed within a new vase. Looking to purchase a beautiful gift for mom this Mother's Day? You can get the new Vase Expressions starting at $49.99 with your choice of flowers. Use this 1-800-Flowers link, and you can also get 15% off right now with the code RETAILMENOT15. I would send flowers to my mom because she's always been there for me and she just helped us with a big move. I like 1-800-flowers on FB. I'd get them for myself. It's been years since I got any flowers. Email in profile. I would order it for my 93 year old Aunt for her upcoming birthday in August if I won. She's just like a Mom and Grandma to my family. it would be for my mom, for her bday!! I would send flowers to my mom. Growing up I didn't understand or wanted to about her having three jobs. Little did I know it was to help us survive. Do I appreciate that now yes with the up most respect. It might seem selfish but I would order them for my own house. My husband and I need a bit of some happiness and pretty items to be in our home. Things of late have been a bit stressful. I would order flowers for my daughter. She lives 1,000 miles away and gets homesick. Flowers would brighten her day. I 'like' Life With 4 Boys on Facebook. I 'like' 1-800-Flowers on Facebook. I think I would order some flowers for myself as I am always ordering for others and wonder what they looked like when they received them. I would like to treat myself for a change. Thanks. I follow 1-800-FLOWERS on twitter. I would send flowers to my grandmother because she loves flowers. I Like Life With 4 Boys on Facebook. I Like 1-800-Flowers on Facebook. I would order the flowers for my mother, who is also my best friend. We recently moved 1600 miles away from her and I miss her everyday. I'd order for mom because she's the best. I would order flowers for my aunt, because she's awesome. I would buy them for my mom. She's had a rough year. I would order for my son who will be graduating soon. I would get them for myself. I can't remember the last time I received flowers and I am all about color in my life right now. Like 1800 Flowers on FB. I'd order flowers for my mom! I would order flowers for my daughter because they always make her happy. Like Life With 4 Boys on Facebook. I'd order flowers for my daughter. I really am proud of her. She's so smart, dedicated & hard working. She's accomplished a lot. My mom, as she is always there for me and I so do not know what I would do without her in my life. She is not only the best mom, but my best friend as well. I would order flowers for myself, probably a flowering plant, because no one else ever gives me flowers and I love them. I would order this for my mom. She would love it. With mothers day here I would have to think about getting flowers for my step mother in law. She would appreciate them. I would order flowers for my friend whose cancer has returned. I would order flowers for my husband because he is awesome! My sister's birthday is next. My best friend because she is going through a divorce. I would order something for me! My mom because she always does nice things for me and she works really hard! I would send flowers to my mom because she deserves pretty things. I like 1800 Flowers on FB as Susan Chester. I'd send them to my daughter just because I love her. Following 1800flowers via Twitter (@Hotsnotty2), Thanks! I would order flowers for my grandparents because they are celebrating their 50th anniversary in a few weeks. I would order flowers from my mom, she deserves them, believe me she deserves them. I would order flowers for my mother because she is special to me! I would order the flowers for my best friend who deserves a surprise. I would order flowers for my Mother-In-Law because she is has been such an amazing blessing in my life! I would order them for my daughter because she could really use a nice surprise! Thanks!! I would send flowers to my sister, just because. Thanks for the giveaway.